Today I welcome Carolyn from the blog, Pleasantest Thing! I think we’ll be playing this great alphabet game out at our house today! The unrelenting heat we are experiencing means that our outdoor games are mostly water games in the shade. 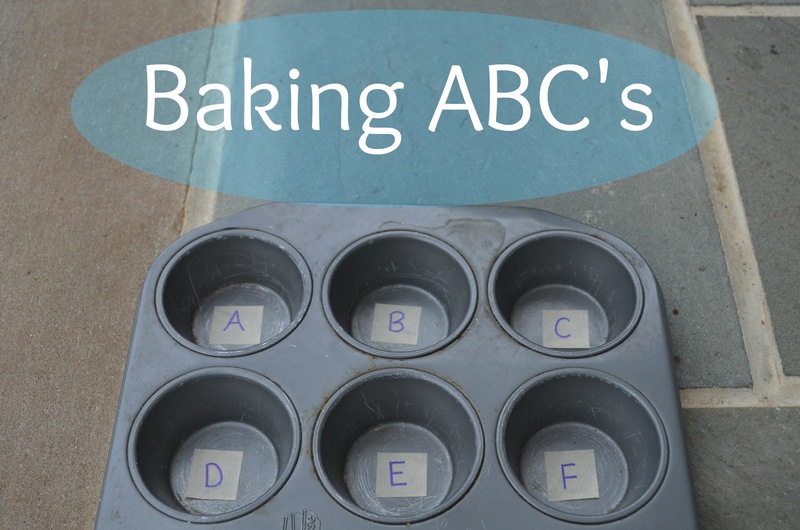 A recent favorite game is “Baking ABC’s.” In addition to getting everyone wet, this is a literacy skill game in which your child can play with sounds and letter recognition. For this game, all you need is a muffin tin, a measuring cup or two, masking tape, and water. Write out a letters on pieces of tape for each cup in your tin, and stick them into the middle of each muffin cup. Fill a bowl with water, and head outside. The game usually ends with splashing each other with water-filled measuring cups! For children who are very comfortable with the alphabet, you can make the game a bit harder by mixing up the order in which you put the letters in the tin. First ask your child to identify the first letter in the word, and next to locate that letter in the tin. For beginning readers, you can put sight words into the tins for your child to identify. You can add another challenge for beginning readers by asking your child to put water in the tin containing the letter before the first letter in your word. When you tell them you are looking for a “raisin” muffin, they would need to put the water in the tin marked “q”. You can also add some math into this, by having a variety of measuring cups, and telling them how much water you need. Carolyn is a stay at home mom to two boys, ages 4 1/2 and 1. She believes play is critical to child development, and her blog, the Pleasantest Thing, chronicles the way she brings play into activities, projects, reading, and meals. With two active boys, the ideas she likes best are easy, inexpensive, and fun! Wait a minute, wait a minute… “Baking fun for a HOT Summer’s Day? !” Anyone else see the problem with cranking up the oven when it’s 102 outside?